Carrington abalone and pearl cufflinks, circa 1935. Other projects in the gallery have necessitated a brief leave from writing about antique cufflinks. But ongoing research continues. I hope to post next month about the beautiful "doubles" created by Krementz & Co. in the years around 1900. 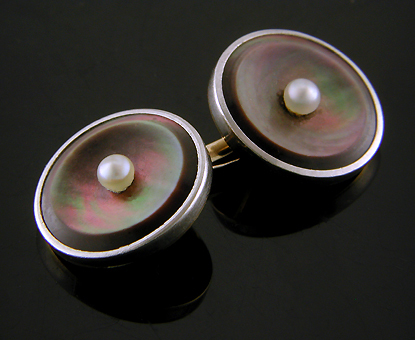 Meanwhile, pictured above is a beautiful abalone and pearl cufflink created by Carrington & Company. A wonderful example of the clean, elegant design favored during the late 1930s. The abalone, a dark aubergine with flashes of red and green, contrasts beautifully with the brilliance of the platinum borders and the white pearls. Crafted in platinum and 14kt gold, circa 1935. These and other fine antique cufflinks can be found in the Antique Cufflink Gallery. Recent additions to the Antique Cufflink Gallery include a striking pair by Carrington featuring abalone, pearls and platinum, elegant Sapphire and Diamond cufflinks, Charles Keller blue enamel and gold cufflinks in the Arts & Crafts style, two pairs of dramatically engine-turned "Big Bang" cufflinks, and an Onyx and Diamond dress set by Carter, Gough. Carrington Abalone and Pearl Elegant abalone and pearl cufflinks in the Art Moderne style of the late 1930s. The abalone is a dark aubergine hue with flashes of red and green. Crafted in platinum and 14kt gold, circa 1935. Sapphires and Diamonds Elegantly engraved platinum cufflinks set with blue sapphires. and sparkling diamonds. Surrounded by dramatic borders of winged volutes and stylized blossoms. Crafted in platinum and 14kt gold, circa 1920. Keller Arts & Crafts Gold and blue enamel cufflinks in the Arts & Crafts style. The brightly polished yellow gold centers are surrounded by a captivating border of blue enamel. Crafted in 10kt gold, circa 1910. Big Bang The brilliance of beautifully engraved platinum and sparkling diamonds. These cufflinks radiate outward like exploding fireworks in the night sky. Crafted in platinum and 14kt gold, circa 1925. Diamond and Onyx An elegant diamond and onyx dress set from the 1920s. The white gold borders surrounding the black onyx are engraved with a dramatic Art Deco zigzag pattern. Created in 14kt gold, circa 1925. Big Bang II White gold cufflinks beautifully engraved with a radiating pattern that explodes like a silvery firework in the night sky. Crafted in 14kt white and yellow gold, circa 1925.
to the Antique Jewelry Gallery.